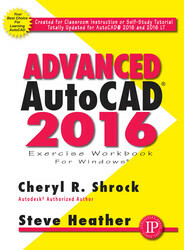 Advanced AutoCAD 2016 Exercise Workbook by Cheryl Shrock and Steve Heather is the right book for users who liked the author’s Beginning AutoCAD 2016 workbook and want to learn more about AutoCAD’s features, including Xref, Attributes, and 3D solids. This clear, no nonsense, easy-to-follow text is totally updated for AutoCAD 2016 and 2016 LT, and it offers several new and improved features. All exercises are easy to print on standard 8 ½"" x 11"" paper. For use with the PC version of AutoCAD 2016 only. Also check out the handy companion book AutoCAD Pocket Reference.